Le Centre palestinien pour les droits de l’Homme (PCHR) publie son rapport annuel 2014 en Anglais. Il inclue un panorama des conditions des droits de l’Homme dans le Territoire palestinien occupé (TPO) et des activités du PCHR du 1er janvier au 31 décembre 2014. De plus, en juin 2015, le PCHR a publié en Arabe un rapport spécial sur Gaza. 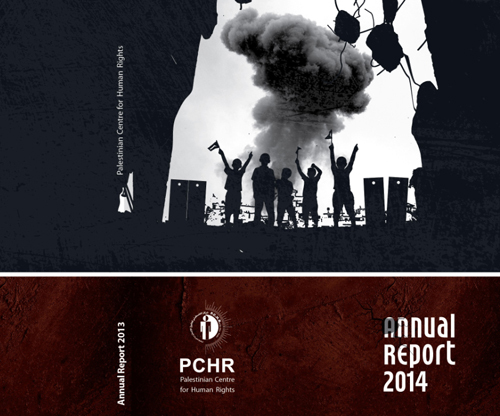 The Palestinian Center for Human Rights (PCHR) has published its 2014 annual report in English, which includes an overview of the human rights conditions in the occupied Palestinian territory (oPt) and PCHR’s activities during the period between01 January and 31 December 2014. In addition, PCHR has published the Arabic version of the report in June 2015 in a special event in the Gaza Strip. Two hundred people from local civil society organizations, government officials, members of the Palestinian Legislative Council (PLC), jurists, academics, journalists, and other prominent public figures attended the event. The publication of the English version of the annual report coincided with the first anniversary of Israeli offensive on the Gaza Strip in 2014, which was the third of its kind, but the bloodiest and most destructive one in less than 6 years. The report covers the Israeli human rights violations and war crimes against Palestinian civilians and property over 50 days of bombing by air, sea and land throughout the Gaza Strip. As a result of the Israeli offensive, 2,216 Palestinians were killed, 70% of which were civilians and more than half of them were children and women. Moreover, widespread destruction was caused against civilian objects including houses, residential buildings, industrial and agricultural facilities, mosques, schools, educational facilities, hospitals, health care facilities, and infrastructure, including electricity, water and sanitation. The report also addresses the Israeli use of excessive force against civilians and property, including indiscriminate shelling and systematic destruction that fully destroyed residential neighborhoods, like in al-Shujaiya neighborhood, Khuza’a village and Beit Hanoun town. Around 1,066 people were killed, 48% of whom were killed due to bombing and destroying their houses over their heads and extermination of entire families. Furthermore, the report addresses in detail violations of human rights and international humanitarian law in the occupied Palestinian territory (oPt) in 2014 and the consequences of the illegal and inhumane closure imposed on the Gaza Strip for the 8th consecutive year. This collective punishment left disastrous consequences on the lives of about 1.8 million people. Moreover, the report shows the restrictions imposed on the movement of civilians by Israeli forces in the West Bank, especially in occupied Jerusalem, whether between the cities or at the border crossings by continuing to establish hundreds of checkpoints on the main roads between the Palestinian village and closing the crossings between areas in the West Bank. At the time of publication of this report coincides ten months have passed since the adoption of the UN Gaza Reconstruction Mechanism which has clearly failed to make any achievements on the ground or meet the minimum requirements of the Gaza reconstruction process following the Israeli offensive. None of the houses that were destroyed has been rebuilt so far. Tens of thousands of Gazans whose houses were destroyed have been facing forced displacement and deterioration of their humanitarian conditions. The report reviews settlement crimes committed by Israeli forces all over the West Bank, including East Jerusalem where Israeli occupation authorities continue the policy of ethnic cleansing against Palestinians and imposing tightened restrictions on them in addition to expelling them from their cities. Meanwhile, the efforts to create a Jewish demographic majority and activities of settlement expansion to connect them with other settlements in the West Bank continued. The Israeli authorities also conduct operations of ethnic cleansing in area C in the West Bank, the cruelest of which is destroying lives of Palestinian civilians there through demolishing their houses ; collective displacement from one area to another under the pretext of conducting military training ; or declaring large areas agricultural lands and pastoral areas as closed military zones in order to destroy aspects of life and increase their suffering. The report addresses the crimes committed by armed Israeli settlers who are protected by the Israeli forces and other systemic crimes and violations committed against Palestinian civilians and their property. The most violent and heinous attack was the kidnapping and burning of a Palestinian child, Mohammed Abu Khudeir from Sho’afat neighborhood, north of Jerusalem. The report also sheds the light on the continued construction of the annexation wall in the West Bank in violation of international law and the Advisory Opinion issued by the International Court of Justice (ICJ) on9 July 2004 which considered the construction of the wall illegal. These violations and war crimes have been committed in light of the impunity enjoyed by the Israeli occupation at the international level. The report also reviews the Israeli judiciary’s denial of the Palestinian civilians’ rights as Israel continues to impose obstacles before victims to deny them access to justice, including closing investigations in most serious crimes. During the preparation of this report, many investigations were closed by the Israeli Military Advocate General (MAG), including the shelling and destruction of al-Wafaa’ Hospital, killing of al-Shat’i children and other crimes committed during the latest Israeli offensive. It is clear that the Israeli judiciary provides a legal cover for war crimes and denies victims’ access to justice. The report also stresses on PCHR’s intention to continue efforts to prosecute Israeli war criminals before the international judiciary. Following Palestine’s accession to the Rome Statute, the International Criminal Court (ICC) provides a good opportunity for legal networking and putting an end to the culture of impunity enjoyed by the Israeli occupation authorities. Moreover, PCHR will give priority to these efforts during the coming period. This report also addresses the Palestinian violations of human rights as for the eighth consecutive year, the internal political conflict and division between Hamas and Fatah movements have been a major factor that led to further deterioration of the human rights conditions. There were hopes that signing the reconciliation agreement in April 2014 and the formation of the national unity government would end the division and unite the Palestinian Authority’s institutions. However, the year ended without any serious steps having been taken to end the political division and the government did not assume its actual responsibilities and the executive, legislative and judicial institutions of the Palestinian political regime were not rehabilitated. The paralysis and disruption of the Palestinian Legislative Council (PLC) continued either due to the arrests by Israeli forces against PLC members or due to the political division. The judiciary continued to deteriorate, and its independence continued as well to be abused by the executive authority. The division still prevents the reformation of an independent, effective and united judicial authority in the Palestinian Authority. PCHR documents in its report the continued violations of the right to life and security. Ninety-nine persons were killed (84 in the Gaza Strip and 15 in the West Bank) while 167 others were injured in the different contexts of misuse of weapons. The Palestinian security services in the West Bank and the Gaza Strip continued to illegally arrest civilians and subject them to torture and other forms of cruel, inhuman or degrading treatment. In 2014, violations of the right to freedom of opinion and expression, the right to the peaceful assembly and the right to freedom of association continued. The report contains recommendations to the international community and the Palestinian Authority.